I was expecting a little more from this film because of the leading actors but I didn't think too badly of it once it was done. I'm not sure if it was just a paint by the numbers kind of movie or if I just happened not to be in the mood for this flick. There is some snappy repartee between Washington and Wahlberg but for my money most of that was in the trailer. There is some toplessness from femme fatale Paula Patton (or her body double) and the requisite amount of bloodshed, doublecrosses and "will he or won't he figure it out" set pieces. So if you like action movies or buddy movies or movies where the good guys have to make last stands against seemingly omnipotent government agencies this could be the film for you. It's not by any means the best work of either Washington or Wahlberg. But it's not supposed to be. It's an action movie. 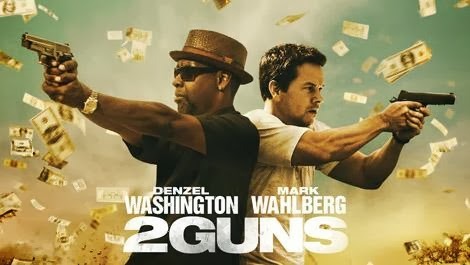 2 Guns messes around with time and flashback so that initially you're not sure what's going on or who exactly is the good guy. Bobby Trench (Denzel Washington) is a gold-toothed thug and middleman supplier of all things criminal or legal who's looking to make a drug buy from Mexican drug lord Greco (Edward James Olmos). Trench's partner is optimistic, motormouthed and supposed ladies' man criminal Mike Stigman (Mark Wahlberg). 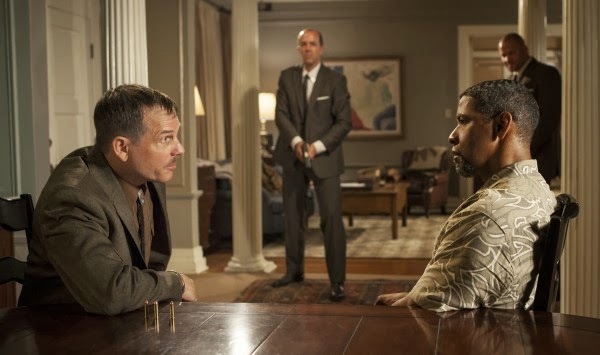 When the drug deal falls through because the paranoid Greco doesn't quite trust Trench enough yet, Stigman suggests that for revenge they rob the bank where Greco deposits his money. Trench likes this plan. The duo carry out the deed, though not before thoughtfully disabling possible police pursuit and discussing the propriety of winking at waitresses. Of course things aren't as they seem. Both Stigman and Trench are far too skilled at surveillance, electronics, gunplay and other special techniques to be low level criminals. They also seem to avoid hurting innocent people. As we learn when Trench is having some fun with sometime lover and semi-supervisor Deb Rees (Paula Patton), Trench is actually an undercover DEA agent tasked with taking Greco down. If he can't get the planned drug arrest he'll take a consolation prize of money laundering charges and the fact that he hurt Greco's finances. He's not worried about Stigman as he believes Stigman is just another criminal and thus collateral damage. Stigman's death could die but Trench is planning for his arrest. Deb may also be having a little something something with their mutual boss Jessup (Robert John Burke). I suppose on some level if Paula Patton asks you what you're doing tonight you don't wonder what she's doing tomorrow. That seems to be how Trench looks at it anyway. Hmm. And Stigman is not really a criminal either. He's actually Navy Intelligence. The Navy wants to steal Greco's money to use for some operations that they'd just as soon Congress or the Joint Chiefs of Staff not know about. As Stigman's boss Quince (James Marsden) reminds Stigman, Stigman is to steal the money, bring it to him and eliminate loose ends, that is to say the "criminal" Trench. Quince "owns" Stigman due to some unfortunate past actions taken by the hot tempered Stigman. After the successful bank robbery Trench is surprised and disturbed when the DEA, which Deb was supposed to tip off for the arrests, never shows up. And both men are shocked to find out that instead of the sum they expected, they've stolen more than ten times that amount. Worried that Trench might indeed be a cop, albeit a dirty one, Stigman shoots Trench in the shoulder instead of killing him and takes the money to Quince. Stigman and Trench each start to thoroughly research their erstwhile partner. Quince is not happy that Stigman didn't follow orders exactly. Greco doesn't like his bank being robbed. And Trench definitely intends to return the "favor" of being shot in the shoulder. This kicks off a series of desperate events, double-double crosses, revealed secrets, hostage takings and showdowns at high noon. The actual organization (take one guess) whose money was stolen sends a literal troubleshooter named Earl (Bill Paxton in probably the best role of the film) to find who stole their money, get the money back and severely punish the thieves as well as anyone who knows or works with the thieves. Paxton appears to having a grand old time as he is constantly smirking at a joke that only he seems to get. He's in a good mood no matter who he tortures or kills. 2 Guns was a decent enough movie, but it's not something which is a must see. Olmos plays a possibly stereotypical part but in a clumsy way the film attempts to balance this by taking a few plugs for comprehensive immigration reform. So there's that. If you like action films or just like Wahlberg and/or Washington this was a passable film. Don't have super high expectations and you won't be disappointed. 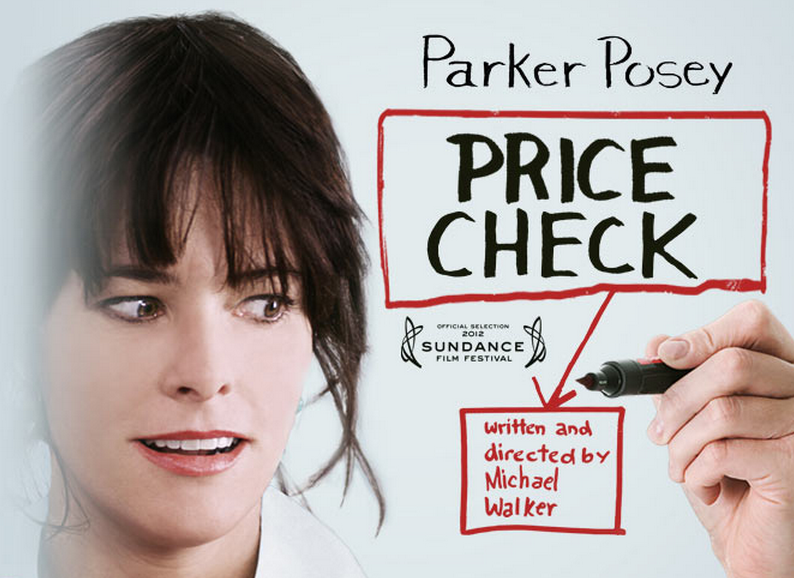 This is an independent film which features indie queen Parker Posey in the lead actress role. She really nailed her role. Her leading man didn't quite seem to be able to keep up with her but maybe the character was written that way. Price Check is a workplace comedy/drama. For my money the genre classic film is Office Space but this film is not quite as over the top as that movie was. It's more adult and more dramatic if that makes sense in this context. It has a similar theme in that a protagonist is trapped in an unwanted job but unlike Office Space, he and his co-workers aren't cartoon characters nor do they have the freedom to just up and quit. Most have mortgages, children, spouses or other supposedly good reasons why they're where they are. So I liked both Price Check and Office Space but they each have totally different reasons for their appeal. Pete Cozy (Eric Mabius) is a price research/marketing analyst at the Long Island New York regional office of the supermarket chain Wolskis, which is owned in turn by the conglomerate ACS. Pete should be working elsewhere. He lacks passion for his job. He soldiers on but clearly his heart is not in the dry analysis of why certain goods sell or don't, where items should be placed for maximum profit, which sales should be run at which time, whether to compete on price or quality or any number of other questions which are critically important to supermarkets and big box stores, but barely register with other people. No Pete's passion is music, or rather managing bands and/or running a record label. That's what he used to do years before. When the tiny indie label he was working at failed he moved to his current job. But he doesn't like it much. The pay is bad. He and his attractive supportive wife Sara (Annie Parisse) have a young son together. Sara doesn't work outside the home. They struggle to pay the bills. But as Pete explains to a somewhat bemused Sara he's avoided promotion because he doesn't think the extra money is worth the additional responsibility and workload. Pete's somewhat introverted. Pete is a strict 9-5 guy who's marking time until...well something. This changes when Pete's old boss retires/is forced out and he gets a new boss, Susan. 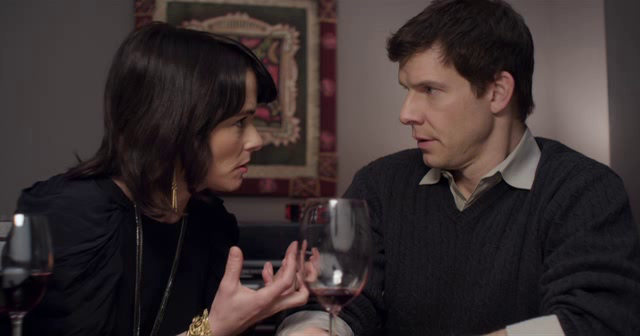 Susan Felders (Parker Posey) is closer to Pete's age. She was a transfer from a different company within the ACS network. She's far more aggressive than Pete's old boss; she intends to shake up her team. Susan is in it to win it and has no time for slackers,"losers", introverts, or people who don't want to have FUN. Susan, who reminds me in different ways of two women I once knew, is a quick tempered high energy profane neurotic extrovert who's seeking her next promotion almost as soon as she arrives. Susan is not overly concerned with ethical or even legal restraints but she does enjoy her job, which to her chagrin, is not something that can be said about everyone on her new team. Susan is aware that she has a company wide rep as a hard woman to get along with. And she likes it. Surprisingly Susan quickly takes a liking to Pete. She seeks his advice on team staffing and finagles an invitation to dinner at Pete's home and to his son's Halloween party. She quickly intuits that Pete is working below his capacity. So despite his protestations she gives him more work and more responsibility. She also casually doubles his salary. This doesn't come without a few attached drawbacks or perks, depending on your point of view. Susan has big plans, which might include Pete if he wants to grab the brass ring. Working with Susan, Pete gets to meet some company big shots. This includes ACS CEO Jack Bennington (Edward Herrmann), a wily old patriarch who tolerates the hard charging Susan as he would a wayward daughter. But Jack also likes what he sees in Pete. Jack is impressed with Pete's Ivy League education and like Susan, thinks that Pete might be cheating himself from getting more from life. Pete lacks confidence though that's changing under Susan's tutelage. Susan never lacks for confidence. When she catches Pete checking out her fishnet clad legs she smirks and says "You like that, right?" Pete's uncertain if he's showing Jack and Susan a false front or if he's changing. Jack and Susan inspire Pete to do different things. He doesn't want to disappoint them. However there's a conflict between disappointing them and cheating himself. I don't know about where you work but I definitely recognized some of my current former work environments in this film. There is sexual tension and jealousy between some people, HR policies be damned. We see rivalries for the next promotion, for access to the boss and for the last donut. There are hostile reveals of unflattering or intimate co-worker information. In one status meeting Susan handles a overly familiar subordinate in a manner which had me laughing out loud and taking notes to use myself. Price Check is worth watching for that scene alone. Many of Susan's tactics definitely work in the gladiator pit which is corporate America. But I'll skip Susan's primary way of getting what she wants which is to throw a screaming temper tantrum. Susan can be quite nasty and passive aggressive. She tells the team they all have inexpensive gym memberships and are expected to use them. When Susan makes this announcement she's looking at one other person the entire time. It's like if my boss somberly tells the team that we have to get in earlier and work later but looks right at me. Mmm-okay... Price Check's other characters are mostly background. This is Posey's show all the way. She handles it well. Fair warning, Price Check abruptly drops all comedic elements about two-thirds of the way thru. It becomes a completely different film. This was jolting, to say the least. You may think about workplace competition. If someone backstabs you, manipulates you or simply plays the game better than you do does that make them a bad person? Can you let those things go and chalk it up to experience? I've always had trouble doing that. Still do, actually. Price Check doesn't give any answers and to the extent there are villains, they seem to skate by. So it's like real life. Everyone is a hero in their own story. I thought the ending was a massive cop-out but I can see why the director went that way.